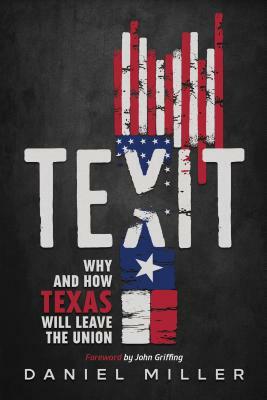 Texit is the first non-fiction book to delve into the motivations, the process, and the practicality of a modern-day Texas exit from United States. Channeling his 20 years of experience on the issue, author Daniel Miller, takes the reader through the historical and cultural foundations of Texit, its impact on mainstream politics, and plainly lays out the grievances expressed by many Texans that drive their support for an independent Texas. Texit also addresses the most common objections with facts and sheds light on what a future Republic of Texas could look like. He has been featured on every major news network and been interviewed by every major newspaper in Texas and around the world. A featured guest on FoxNews, CNN, CNBC, BBC News, RT-TV and many other news outlets, Miller has been a vocal proponent of a fundamental reexamination of the relationship between all states in the Federal union. In 2011 he authored Line in the Sand, his first book, which addresses the roots of Texas Nationalism and the practical implications of national self-identity for Texans. Taken from years of experience, Line In The Sand, has become a primer in the fundamentals of Texas Nationalism.